Discussions Magazine Music Blog: THE CHANCELLOR reviews the ANTI-NOWHERE LEAGUE 4CD box set! THE CHANCELLOR reviews the ANTI-NOWHERE LEAGUE 4CD box set! 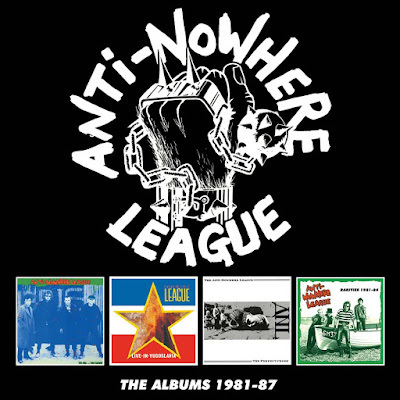 Iconic British punk band Anti-Nowhere League –lead by vocalist Animal - is best known on these shores for their 1981 song “So What,” which was famously covered by Metallica in the ‘90s (and appeared on their legendary GARAGE, INC. release). However, there are many fans of that song who have yet to hear ANL’s original recording… or anything else by the band for that matter! Thankfully, Captain Oi/Cherry Red Records have just made it easy (and inexpensive) to collect the band’s most seminal material in one handy four CD box set entitled ALBUMS 1981 – 1987. While they weren’t exactly the most prolific Punk band to emerge from the UK, they certainly made each release count. Mixing the energy of Punk ’77 with the fist-pumping fire of Street Punk, ANL blended the blunt edge of the UK Subs with some choice hooks reminiscent of pre-LONDON CALLING material by The Clash while not sounding like either of those two bands. Fans of early Stiff Little Fingers, 999, The Lurkers, The Stranglers, The Business and other like-minded hook-conscious British Punk acts are probably keen on Anti-Nowhere League already… but just in case you’re not, then it is time to take these lads out for a spin! WE ARE… THE LEAGUE (1982) – the first CD in this set - was a damn fine debut. While The Exploited and GBH may have been gaining more steam in the States around the same time, ANL were certainly worthy of much more attention than they actually received. With lyrics that ensured that they would not be played on U.S. radio, songs like “Animal,” “(We Will Not) Remember You,” and “Woman” and, honestly, almost everything else here on the album is full-force Brit Punk. Full of attitude, spit and spite, the boys in the band were not afraid to add little hooks to snag the listener. Now, don’t get me wrong – ANL are far from a Pop band but this album has some crackin’ tunes that stick in your head. The band’s cover of Ralph McTell’s “Streets Of London” is a definite highpoint. Overall, it is a solid debut and is still cited as being one of Punk’s finest full-length releases some 36 years later. And I haven’t even mentioned other great tracks like “Can’t Stand Rock ‘n’ Roll” and “I Hate… People”. This is Punk, my friends. Forget your Green Days and your Blink-182s – this is sweaty, aggressive Punk with plenty of ‘tude but doesn’t mind bringing a tune along for fun! The fourth and final disc of this set mops up non-album singles, b-sides, demos and rarities. And for those of you paying attention, “So What” is on this disc! The tracks on this disc are rough, raw and wild. Highlights include single versions of tracks like “I Hate… People,” “Let’s Break The Law” and “Woman” plus other gems that help sum up the band’s career including the demo of “Going Down” (which is featured as a live track on Disc 2 of this box set. Still alive and kicking, Anti-Nowhere League is in a class of it’s own. Now, get a copy of this set and experience it again/for the first time.